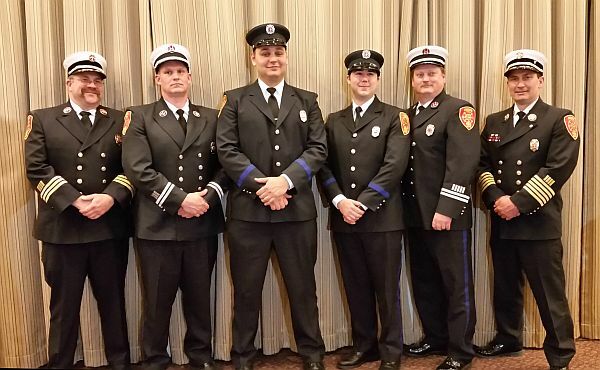 Keene Firefighters James MacLean and Daniel McKenna were recognized by the NH Police, Fire and EMS Foundation at their 8th Annual Recognition Dinner. The dinner was on Wednesday night at the Radisson Hotel in Manchester. Firefighters MacLean and McKenna each received Life Saving Awards for their actions last December, during the Liberty Utilities Incident. Crews were called to respond to the Hallmark on Main Street for an odor of gas in the building. Firefighters MacLean and McKenna entered the building to locate the possible source of the odor. The firefighters donned their masks after encountering a strong odor in the rear of the building and tried to locate the possible source in addition to searching for any l occupants requiring evacuation. Upon entry into the stock room, a female was lying on the ground, unconscious. Firefighter MacLean picked up the woman and removed her from the building while Firefighter McKenna continued to look for additional occupants, none were found. The quick responses of Firefighters MacLean and McKenna were undoubtedly responsible for saving the life of the young woman with other firefighters and medical personnel on the scene.